Leveraging advanced capabilities to drive efficiencies for the contact center. If you are stuck in a world in which customer relationship management (CRM) software can only play in the sales sandbox, it’s time to think outside the box. CRM vendors crossed those boundaries long ago with a range of capabilities that organize, automate and coordinate sales, marketing, customer service and technical support. 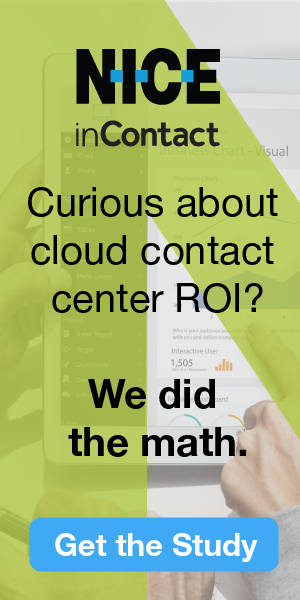 They’ve paved a road to operational efficiency that help contact centers serve their customers in excellence, across media, while delivering a more satisfying experience for their agents and organizational peers. And all of that drives a sweeter bottom line for the center and the enterprise. It’s time to take a second look at CRM to discover how a comprehensive approach can transform centers and deliver comprehensive results (see Figure 1). CRM breaks down interdepartmental process and data silos to establish a common view of the totality of each customer relationship. It coordinates and reports on activity across interaction channels (e.g., inbound calls, outbound calls, email, fax, chat and social media) and organizational boundaries. It equips the enterprise to present itself as a united front to the outside world and behave like one internally. Agents revel in the CRM’s capacity to provide access to key customer information at the start of each session. They don’t have to go on hunting expeditions across multiple systems or screens to find essential customer information or fulfill requirements for verification. Everything they need to launch a discussion is provided conveniently on the main screen. They also have ready access to each customer’s services, recent purchases and interaction history across a range media. This information helps them come up to speed quickly on each relationship and situation, and tailor their conversations accordingly. Agents come across as polished and professional while the center reaps the benefit of lower average handle times (AHT) times and improved first contact resolution (FCR). The result is a strong business case and reduced customer effort. Knowledge management improves efficiency as interactions go to the next level. This technology provides access to resources that respond to frequently asked questions, identify internal resources or processes to handle varying transaction types, and/or comb the enterprise library to respond to specific customer needs. It further reduces AHT and boosts FCR while promoting consistent responses across agents and self-service channels. CRM solutions may incorporate this functionality or provide access to it via integration with specialty software. CRM applications have the ability to create workflows to process interactions from end-to-end. This capability is particularly useful when departments and/or subject-matter experts outside the contact center must be engaged to address customer needs or resolve issues. These workflows define “handoffs” as well as follow-up routines to ensure fidelity to response-time commitments, all based on business rules. If appropriate, reminders prompt agents to re-engage based on status or outcomes, or draw in supervisory attention as an escalation point. Alarms identify process steps that require immediate intervention. Customers enjoy improved responsiveness while the center profits from cost efficiencies and customer retention. Customer satisfaction tracking and reporting can be tied to CRM to improve the center’s overall effectiveness. In particular, the system can tie customer feedback to specific interactions and agents to help pinpoint the source of both favorable and unfavorable reviews. When combined with the quality assurance program, it provides a 360-degree view of each agent’s performance. This customer-specific data also informs business rules that determine when/if a customer should, or should not, be offered the opportunity to participate in a survey. Finally, CRM gives the marketing department a boost in market intelligence by providing access to a wealth of data on customers’ interactions with the enterprise. It helps analysts determine whether the company’s brand, products and services are measuring up to expectations. It also provides guidance on the development of new products, services and marketing campaigns. If you’ve been persuaded that CRM good be a good thing for your contact center, the challenge is finding a way forward that makes strategic, operational and financial sense for your center and the enterprise. As a starting point, you’ll have to consider your existing technology landscape to determine where and how CRM might fit in. You may already have a CRM system in the enterprise that could be augmented to support your contact center. Sales departments generally use these applications to orchestrate, manage and track their sales process as well as communicate with their customers and prospects. Marketing may use the tool to glean insights about their constituents and to track the effectiveness of promotional offers and other campaigns. Spend time with your interdepartmental peers to see what they have and how they use it. Look to their vendor to see what their product might do for you. At a bare minimum, this investment in time and energy will get you better informed on CRM capabilities as you launch your own journey of discovery. Whether you leverage a pre-existing CRM solution or choose to implement a new one, you’ll be faced with decisions about what to do with your current technology. As noted in the sidebar, most centers already avail themselves of a customer information system (CIS) in some form. So, at a minimum, you’ll have to figure out what role it will play in your future state. You may also need to factor in other business specific applications such as order processing, claims management, billing, etc., to determine how they impact the planning horizon. CRM application integration is not a straightforward affair, nor is there a one-size-fits-all approach to doing it. For example, CRM could simply be the means through which you provide coordinated, well-designed views into other applications. Or perhaps, CRM captures an initial set of information, passes the data off to another system to process the data, and then retrieves a result to complete the transaction and record the outcome. The degree of integration with other systems can depend on the nature of the transaction and/or function being performed. And, of course, you need to determine the extent to which the CRM solution needs to be a “good citizen” by providing information and services to other applications. For example, CRM may become the global “note-taking” engine for the enterprise by storing and categorizing all unstructured customer data in a single repository. If notes are needed for a back-end system, CRM pushes the appropriate information upon request. While integration challenges may make one’s head spin, that course of action may be preferable to biting off a fully featured, all-encompassing CRM solution in one fell swoop. As with any major implementation, it takes a healthy chunk of change—both financial and organizational—to bring a new solution online. You need to determine how much change you can realistically handle, and how that investment in time, talent and money stacks up against a phased implementation approach with the accompanying integration and support issues. And, of course, you need to determine the extent to which CRM really can replace functions performed by other systems. CRM certainly isn’t the end-all, be-all solution for everyone. If your primary “pain point” in the contact center is navigating multiple systems and screen presentations to address customer needs, a consolidated desktop application (CDA, aka unified agent desktop) may be your best option. Or, if internal and interdepartmental handoffs and follow-ups are your undoing, a workflow engine might be the game-changer with less investment in time and expense. A key consideration is the extent to which the complexity of integrating and administering multiple specialized systems remains sufficiently manageable that it outweighs the benefits and expense of a fully integrated solution. You’ll also consider the degree to which having multiple vendors take their respective licensing fees becomes untenable for your business case. CRM is not a solution that should be evaluated, purchased or implemented on a silo-by-silo basis. The real benefit comes from consolidating customer data and interaction history across all points of access throughout the organization. While CRM nirvana may not be attainable, it merits a substantive effort by all affected parties to get as close to it as possible. And that means making a proactive effort to communicate with other stakeholders and work together on a solution that best serves the enterprise as a whole. Be prepared to secure professional services as you plan for and implement CRM functionality. These subject-matter experts are crucial team members. They’ll let you know what’s possible with the solution, provide sage advice on what works in the real world, and help you focus on the organizational changes that need to accompany the system changes. They’ll help you size the implementation and plan phases to manage scope. And they’ll provide expert advice as you weigh the merits of configuring the standard solution versus tailoring it to your distinct needs with custom software. With a team effort, your planning and implementation will ensure that the “left hand” knows what the “right hand” is doing and reap greater rewards for all. And, of course, customers will have a more satisfying experience when “all hands are on deck” to serve them as a united and coordinated front. Can’t I Just Use My CIS— or Build CRM Functions into It? Generally, contact centers use some form of customer information system (CIS) with data about the customers they serve, but most of these systems prove inadequate when it comes to interaction tracking. The workaround generally involves capturing a few details in the notes section. Unfortunately, notes are both optional and unstructured, making it difficult for anyone using them to gain a true sense of the relationship and history. And, of course, unstructured notes don’t lend themselves readily to reporting or analysis. Moreover, critical information about the customer from a contact center perspective can be spread across multiple screens or tabs, making it awkward and time-consuming for agents to pull everything together in service of their customers’ needs. This arrangement is inefficient and ineffective. Some companies think they can overcome their CIS limitations by building an interaction tracking capability and other CRM-like capabilities within their CIS. After all, this approach preserves an existing investment and saves money, right? Not necessarily. More often than not, homegrown systems fall far short of expectations and rely on too few individuals who don’t have time to meet the evolving needs. Table 1 shows some of the key considerations in building a custom solution versus buying and configuring a product available in the market. The good news is you don’t have to replace your CIS to gain the benefits of CRM. CIS could maintain the customer database while CRM records the transaction history and/or provides the agents’ user interface. CIS could perform selected functions long term, or as you phase in additional CRM capabilities, thereby mitigating risk and the challenges of organizational change.